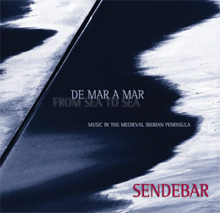 Sendebar performs a compilation of thirteenth-century Iberian music including Cantigas da Amigo of Martin Codax, Cantigas de Santa Maria of Alfonso X, and music from the Llibre Vermell of Montserrat. "…the recording is attractive and alluring." With the Atlantic Ocean in the North and the West and the Mediterranean in the South, the Iberian Peninsula finds itself overwhelmingly framed by the sea. This land that stands only a few kilometers from the North African coast, possesses an astonishing history of cultural exchange between Islamic culture and European Christianity. Our recording "De Mar a Mar," whose title is taken from an expression used by thirteenth-century Galician troubadours to refer to the reunification of Iberia under a Christian banner, explores the rich repertoire of thirteenth- and fourteenth-century Medieval Iberian music composed in connection with some of the most important cultural centers of the Peninsula. The first two pieces in the recording, Mia irmana fremosa and Quantas sabedes amare amigo belong to the corpus of the so-called Cantigas d'Amigo, a literary genre that consists of a monologue spoken by a young woman who anxiously awaits for the return of her lover. These two songs, attributed to the Galician troubadour Martin Codax (active around 1213), make reference to Vigo, one of the most important Iberian ports on the Atlantic Ocean. As it is also characteristic of the genre, their poems are organized by couplets (groups of two lines) that present "parallelism," a poetic technique in which the text of the second couplet repeats almost verbatim that of the first one. This is device to both intensify the theme of the piece and to unfold systematically each idea in two parallel scripts. The parallelism of the pieces is further enhanced by a procedure called "leixa pren," in which the first line of the third and fourth strophe are identical to the last line of the second couplet. The pieces, as it is also customary of the repertoire, contain each a refrains that diverge from the thematic and poetic structure of the rest of the piece. In terms of the development of the Cantigas d'Amigo repertoire, scholars have suggested that it evolved from an older genre of female songs native to the Peninsula that was formalized by twelfth- and thirteenth-century Galician troubadours who were connected to the intellectual environment of Santiago de Compostela. The biggest bulk of pieces include in this recording belong to the corpus of the thirteenth-century Cantigas de Santa Maria (CSM), a collection of more than four hundred monophonic pieces in Galician-Portuguese, composed and compiled in Castile in the multicultural court of King Alfonso X "the wise" (1252-1284). The poetry of most of these pieces is narrative and usually recounts miracles performed by the Virgin Mary throughout the known world. In general, the pieces in the corpus of the CSM are comprised of an initial refrain of two or more lines that is followed by a stanza. This stanza begins with a change of rhyme that is heard three times before returning to the original rhyme of the refrain. After that the refrain is presented again. Thus, the CSM poetic structure is constituted by an AAbbba AA rhyme scheme. The correspondence of the Cantigas' strophic form with that of the zejel, the most popular poetic structure in Islamic Iberia, suggest a close relation between the two forms. In terms of their music, the poetic structure of the CSM are often set to a tripartite musical form in which the refrain and the second half of the stanza are set to the same music while the stanza's first half is set to a different melody. Since the music of the refrain is presented again before its rhyme is restituted at the end of the stanza, therefore, there is no exact correlation between the poetic and the music structures. This asymmetry stands as the most representative feature of the repertoire. Except for one, all the CSM included in this recording follow the above-mentioned poetic and music structures and recount miracles performed by the Virgin Mary in Iberian soil. Of these compositions, CSM 22 and CSM 104 narrate miracles performed in Galicia, CMS 302 and CMS 194 speak about miracles executed in Catalonia, and CMS 166 tells of a miraculous healing that occurred at the church of Santa Maria de Salas in Aragon. Conversely, CSM 340 Virgen Madre gloriosa is an exception to the rule. This piece is not a narrative piece but a lyrical praise-song (Cantiga de Loor) that represents the Virgin Mary as a vehicle between God and his followers. The piece further differs from the others in its lack of refrain, its rhyme scheme, and in that every line, except for the first two, receives a different melody. Scholars have explained that this cantiga is poetically and musically based on Sanc fui belha ni prezada, an alba composed by the Occitan troubadour Cadenet. The last piece in our recording, Los set gotxs, comes from the Llibre Vermell de Montserrat, a manuscript produced during the early fourteenth century in the scriptorium of the Monastery of Montserrat, the most important pilgrimage center in Medieval Catalonia. We know from an indication that appears in the manuscript that Los set gotxs, as well as the other pieces included in the Llibre Vermell, were composed to be sung and danced by the pilgrims during their stay at the monastery. By prescribing these pieces the establishment was trying to replace the visitors' music, considered to be lascivious and impious, with "honest and devout songs." Los set gotxs, is the oldest extant piece written in Catalan that celebrates the seven joys of the Virgin Mary, a traditional subject in Catalonian literature. The piece is comprised of a stanza whose text is set to a melody that presents open and close endings (ouvert and clos), and a refrain that is repeated twice. In the manuscript Los set gotxs is described as a ball redon (round dance) a categorization that indicates that the piece was in fact intended to be danced. The inclusion of round dances in the Marian cult is well testified by contemporary musical iconography. The best example is probably one of the illustrations that accompany the Cantiga de Santa Maria 120 from the Codex El Escorial T.J.I. where a group of musicians play honor of the Virgin Mary while a group of men perform a round dance. And let's watch the waves! And we will bathe in the waves! Y nos bañaremos en las olas! quen te loar saberia ou podia? senon por ti, que fust' alva. Who would know how or could ever praise you appropriately? quien pudiese o supiese loarte? There was once man who, because of his sins, became a cripple. This man remained in this sadly state without been able to move for five years. Nevertheless, he promised that if he would be cured he would travel to Salas each year and offer the Virgin Mary a pound of wax. As soon as this was promised, the man got well. Then, he went to Salas bringing the promised wax without feeling any pain even though his limbs were crippled for a long time. The Holy Mary was praised not only for this miracle but also because she helps the sick and prays for us and our sins. Thus, we should always be faithful servants. Había una vez un hombre quien fue tullido por cause de sus pecados. Este hombre tuvo que permanecer en este lamentable estado sin poder moverse por cinco años. Pero prometió que si sanaba iría todos los años a Salas a ofrecer una libra de cera, y tan pronto hizo la promesa se curo de su enfermedad. Así, el hombre se fue a Salas caminando sin sentir ningún dolor. Por este milagro, y por el hecho de que la Virgen libra a los enfermos de sus Dolores y reza por nosotros la gente dio gracias a Santa Maria. Por estas rezones debemos siempre ser sus vasallos. The Mother of God has great power to defend and protect Her faithful. Great power to defend those in need who call upon her was given to Santa Maria by her son. In relation to this I will tell you of a miracle performed by her during my days. In Armentira there was a farmer named Matthew whom a knight went to kill because of his enmity with the farmer's own lord. The knight threw a spear at him and struck him but did not hurt him. This was because the farmer called on Virgin Mary for assistance by saying: "Lady, save me as you save your faithful. Do not let me die because I don't deserve any harm." Those unbelievers who witness this miracle immediately became believers. Gran poder tiene la Madre de Dios de defender y amparar a los suyos. Gran poder de defender a quienes le llaman le fue dado a la la Virgen por su hijo. De esto os contare acerca de un milagro que ocurrió durante mis días. Ocurrió en Armenteira que un caballero fue a matar a un Labrador llamado Mateo por vengarse de su señor. Cuando el caballero vio al Labrador le lanzo su lanza pero aunque lo alcanzo no lo no pudo herir pues el labrador había llamado a Santa Maria para que lo socorriera. Las palabras del Labrador fueron: "Señora, sálvame como salvas a los tuyos. No me dejes morir que no lo merezco." Aquellos incrédulos que vieron el milagro echo por la Virgen se convirtieron en creyentes. á de tornar sobre sí. que mi o demo fazer fez." No one can so displease the Virgin as the one who tries to offend Her Son. And, it is well known that if anyone tries to do this the offence will turn against him. Concerning this, I will tell you of a great miracle conducted by Santa Maria. It happened in Galicia that a squire kept a concubine. And because he was already married, the concubine was in great sorrow. To alleviate her pain, she ask for what to do to her neighbors. They told her that if she could steal a host from the church the squire would be exclusively hers. She went to church and received communion from the priest gave and keeping the wafer in her mouth she run out of there as soon as she could. But, when this woman entered a town called Caldas de Reyes, where she lived, red blood began to run down from her headdress. The woman returned at once to the church and knelling herself before the statue of the Virgin said: Worthy Lady, don't blame me for my sin because the devil made me do it." Then she went to a convent and became a nun. Nadie puede causar a la Virgen tal pena como quien ofende a su Hijo. Es bien sabido que quien hace ofende a la Virgen esta ofensa se le devuelve así mismo. De esto os contare un gran milagro que hizo la Virgen. En Galicia había un escudero que tenia una concubina. El echo de que el ya estuviese casado enloquecía a esta mujer. Por esta razón, la concubina pregunto que hacer a sus vecinas. Estas le dijeron que si ella pudiese robar una ostia de la iglesia, entonces el escudero seria completamente de ella. Así, la mujer fue a la iglesia y tomo la comunión. Sin tragarse la ostia la mujer corrió fuera de este lugar lo más rápido que pudo. Pero, cuando entro en su pueblo, llamado Caldas de Reyes, inmediatamente empezó a sangrar de su tocado. Entonces, la mujer se volvió a la iglesia y postrándose ante la Virgen dijo:"Valiosa Señora, no me culpes por mi pecado pues el diablo me hizo hacerlo." Después se fue a un convento donde se ordeno monja.